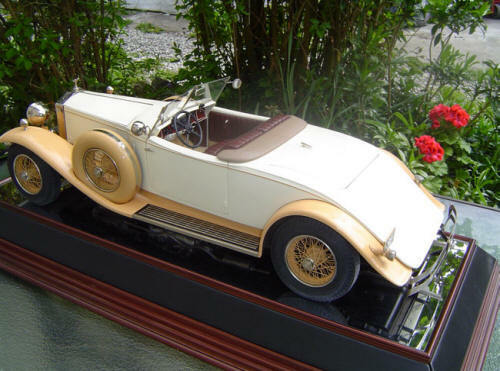 These models are a combination of the chassis and wheels, from the (Italian) Pocher Phantom II kit, and a completely new body built by us. 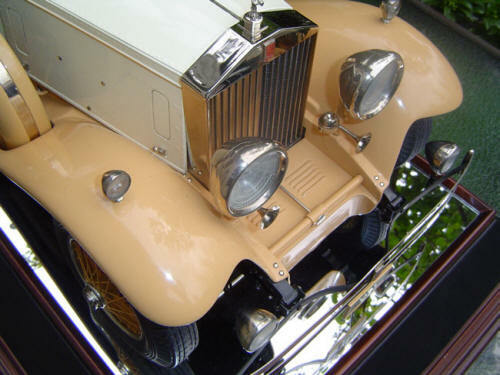 Back in the 30's, American coach builders imported new, Rolls-Royce Phantom II chassis from England, and designed, built, and fitted new, and very sleek bodies onto them. The logic behind this practice was to use the beautifully engineered, and reliable British Rolls-Royce chassis and engine, and fit them with their new and more modern bodies, to appeal to the young and wealthy in the U.S. Their were quite a few body builders that did this, but the Brewster Coach Building Company in New York built this particular design, 1931 Henley Roadster, that we feature here. Our decision to build this model was prompted by Mr. & Mrs. Allan Winks, who asked us to build up some Italian Pocher Kits for them, to sell through their company "Historic Marine" in Vancouver, BC. 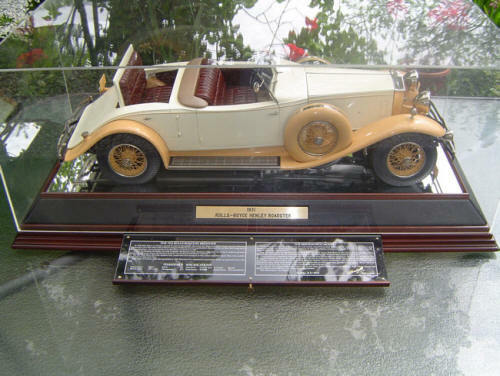 We thought it would be more interesting to do what the early coach builders did, and reproduce the models with American bodies fitted, instead of Pocher's English style Phantom II bodies. 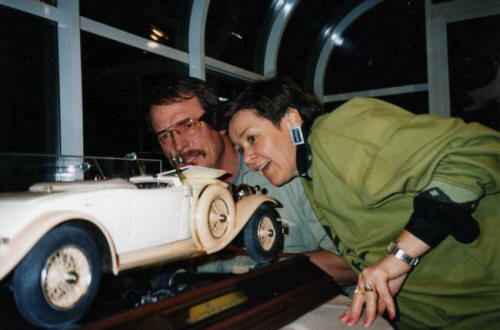 Elza and I delivering the first 1931 Rolls-Royce Henley Brewster Roadster model to "Historic Marine's first clients in Vancouver BC Canada. The pictures below, feature this first model in detail. Below that, is a explanation of exactly what modification we made to the Pocher Kit, in order to produce this Brinkworth/Pocher model. 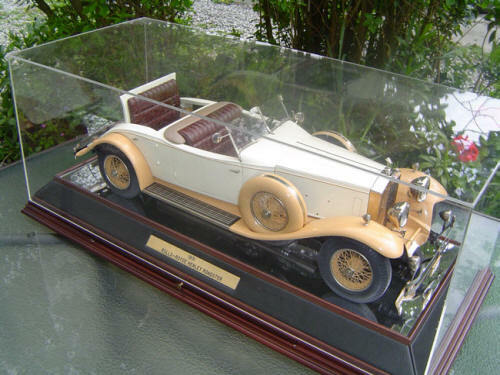 A bereavement in her family, has prompted the need to sell this model. The last I heard, it was still available. Anybody interested, should contact me, and I will put you in touch with her directly. We were commissioned to built three more of these 1/8th. 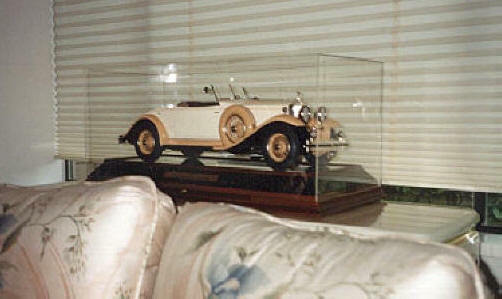 scale models in 1990 which were all sold through "Historic Marine" in Richmond B.C. Canada. To see more, click the image to the left. 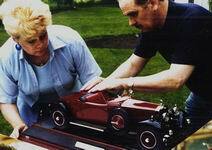 Later, we built another version of the 1931 Rolls-Royce Henley Brewster, "without" the use of the Pocher kit. 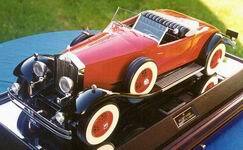 It was an ALL Brinkworth model. Click the image to the right. Below is a more detailed explanation of how the first models were built. Chassis: The main frame and many of it's component parts, were used from the Italian Pocher kit of the English RR Phantom II. 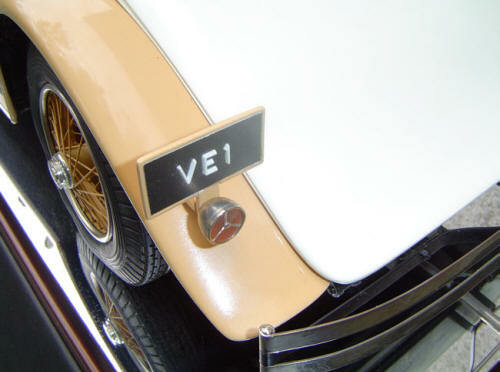 This included the exhaust system, axles, brake drums, engine, steering wheel and column, spoke wheels, tires, radiator, flying lady emblem, headlights, side fender lights, and horn assembly. 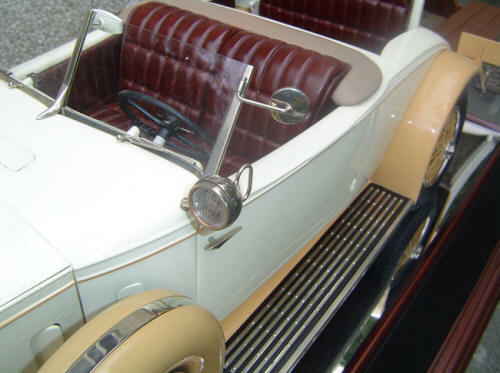 Chassis Modifications: As our model was to be of the American "left hand drive" version of the Phantom II chassis, many modifications had to be made to the Pocher parts. 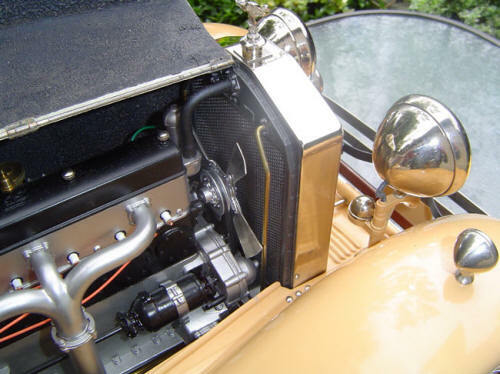 As the steering column and the controls had to be switched to the other side, it was necessary to modify many of the engine parts, in particular the exhaust system. 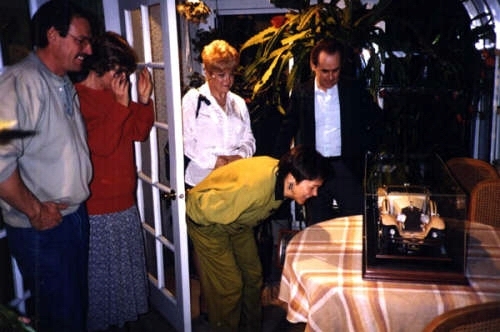 In some cases, new molds had to be made, in order to produce the new castings. Henley Brewster Body: The particular design of Brewster body that we decided to replicate was featured in the excellent book by John Webb DeCampi "Rolls-Royce in America". 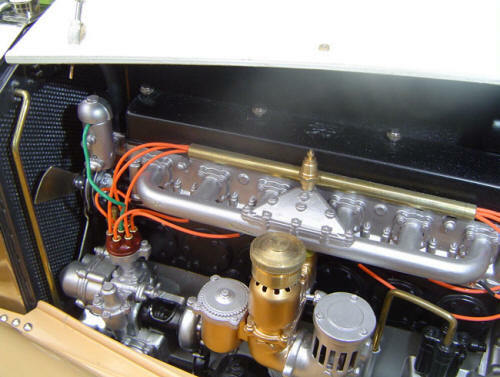 It appears that a few of the original motor cars have been restored or maintained in excellent condition by a number of collectors in the U.S. today. The floor board section from the Pocher kit was also used to tie the four fenders together into one large assembly. 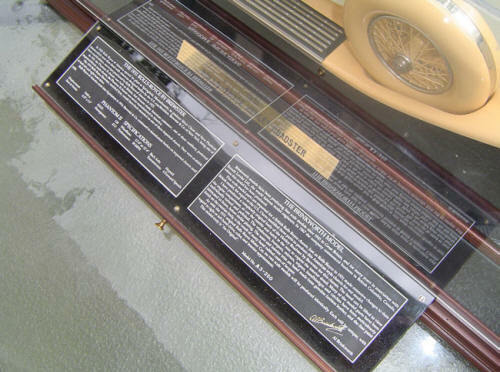 The Henley wings are a unique design, and do not resemble the Phantom II wings in the Pocher kit, so they had to be prefabricated from plexiglas and body fillers. Once this complete assembly was finished, a rubber mold was made. Using various epoxy and polyester materials, castings were made of the floor and fender assembly. The engine compartment bulkhead from the Pocher kit was modified, and used as part of the new body shell. 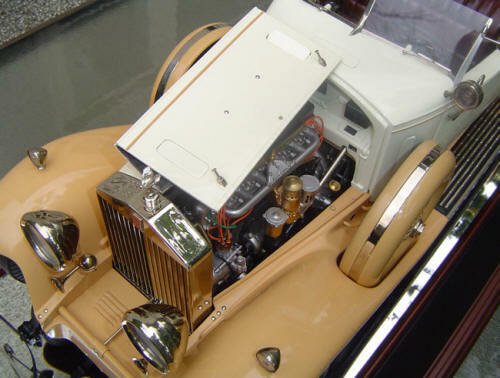 With the use of plexiglas, metal and body fillers, the original plug for the main body was built. This assembly contained the aperture for the rear hatch, and the two side doors. A rubber mold for this assembly was made, enabling us to make castings in various epoxy and polyester materials. The two main doors, the small hatch compartment door, and the hatch door were made the same way, and rubber molds were produced. 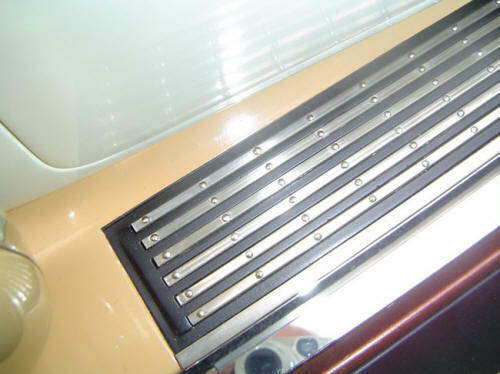 Bumpers: The bumpers are individually built from flat brass strip and tube. Jigs and dies were made to form the unique shapes, which were then soldered together. 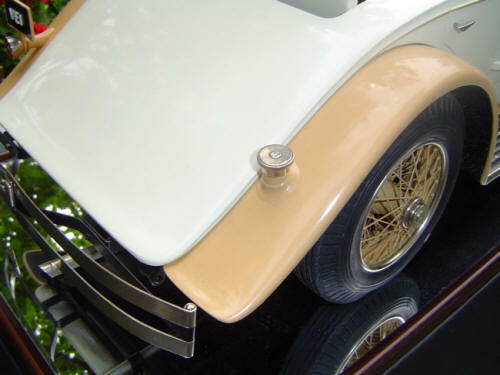 The spring strip assemblies behind the bumpers were built in the same way. Bumpers were then polished, copper plated, and then nickel plated. Spot lights on the bumper were from metal casting we did in house. 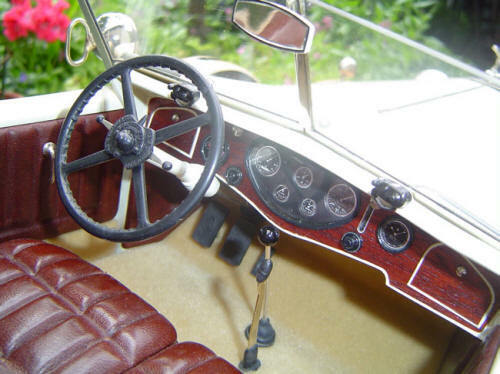 Windscreen: One of the very distinctive features of the Henley Brewster is this centre split screen. It consists of three vertical elements, and one horizontal base frame, molded to the shape of the body. The two plexiglas panes are open at the top. The centre vertical element has a streamlined section at the bottom. We manufactured these screen assemblies individually with brass channel, box section and solder. Polishing, copper and nickel plating gave these pieces their final finish. Rear view mirrors, and screen spotlights were also scratch built and finished in the same way. 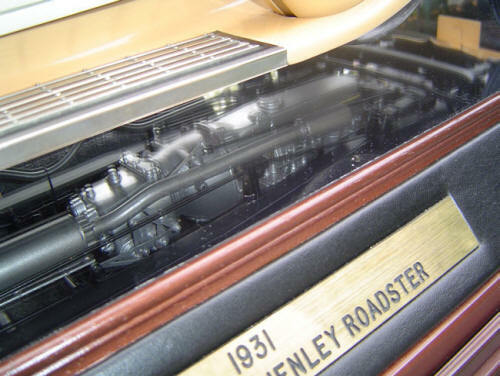 Dashboard: Many hours were spent replicating the classic shape of the Henley dashboard assembly. Full size artwork of the instrument dials were created, reflecting the smallest detail such as the RR logo. These were then reduced, and printed in 1:8 scale. 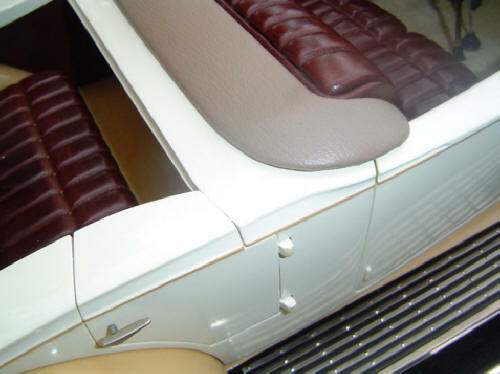 The dash was covered with a micro thin wood veneer, and the instruments put behind clear acrylic with metal bezels. Simulated switches and push/pull knobs were then added. Gear shift, handbrake and foot controls are all built to the exact specification of these classics. The interior door handles were hand built from brass, and the exterior door handles are metal castings that we actually cast ourselves. All these parts were nickel plated. 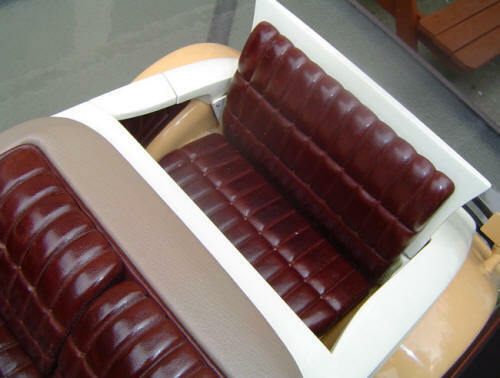 Seats and door trims: Seat cushions and backs were made from plexiglas and body filler to form the basic ribbed shape. As was the door trims, and inside walls of the cockpit. They were than covered in the finest glove leather we could find. 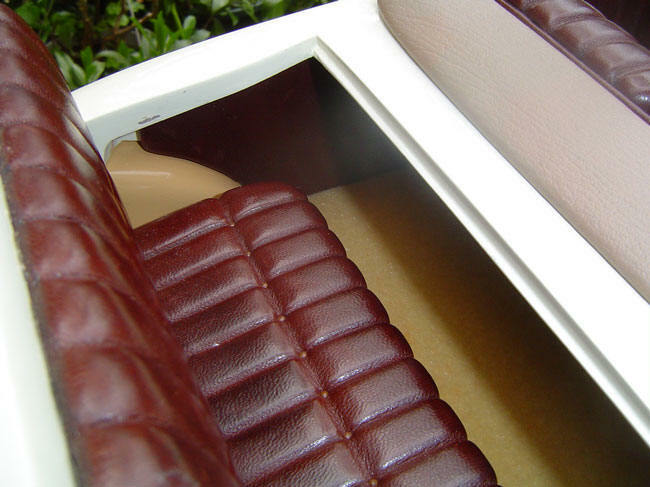 The leather was then treated with the required colour of die, to match the interior trim. Doors: The doors were not made to open, as it was possible to see the interior with them closed. Where possible, we try to keep moving parts to the minimum, in order to guard against rough handling. Unfortunately, the only way it was possible to see the interior of the rear hatch compartment, was to make the hatch open. If we had fixed it in the open position, you would never get to appreciate the beautiful lines of the back of the vehicle. Engine Compartment: This was also the case with the engine compartment. 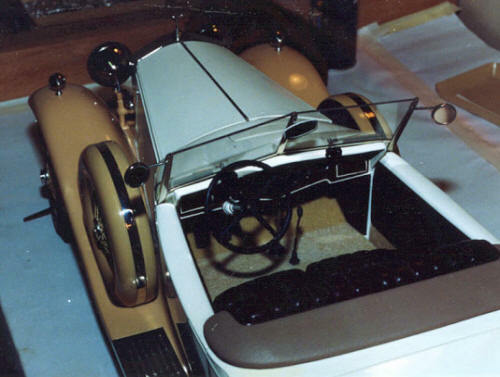 It was necessary to make the hood or bonnet lift, in order to see the engine detail. Model Base: In order to see the underside of the model, we decided to cover the base surface with an acrylic mirror. Leather covered panels surround the plinth, inside the clear acrylic cover. Wood moldings form the main base, which has a draw in the front, containing a brief history of the actual Henley Brewster, and also the model.